As Mark mentioned, we decided to try making sauerkraut for the first time this year. My reasoning was two-fold. First, although we had fun experimenting with kefir, when we stopped using the fermented milk product for a while, Mark's stomach felt better, not worse, so we're still looking for the proper probiotic to keep him healthy. And, second...I grew an absurd number of cabbages this spring and they have to go somewhere. Of course, when I want to try something new, I head straight for the books. Sandor Katz is the poster child for fermented foods at the moment, and he has several titles out on the topic. I'd heard that his Wild Fermentation is the basic book for beginners, so even though it pained me to pass up Katz's 500 page The Art of Fermentation, I decided to save that lengthy tome for a treat in case we decide we do like sauerkraut. 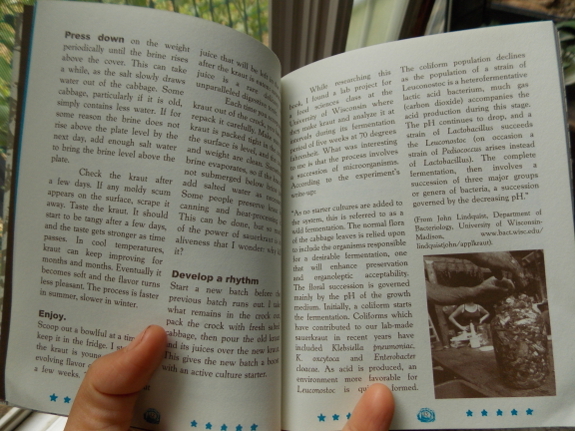 Unfortunately, I didn't research quite far enough, and got the very small, booklet version of Wild Fermentation (subtitled "A Do-It-Yourself Guide to Cultural Manipulation") rather than the expanded version with the same title (but subtitled "The Flavor, Nutrition, and Craft of Live-Culture Foods"). If any of you are following in my footsteps, the book I read is fun and beautifully laid out, but is very short --- I'd recommend upgrading to the longer version of Wild Fermentation. Or just start with Katz's sauerkraut recipe, which you can read for free online. Anyway, to cut a long story short, I mixed up my first batch of sauerkraut in a matter of minutes Friday evening, and the salty juices soon filled the bowl. Since we don't have a big ceramic crock, I followed one website's advice and figured a stainless-steel bowl would do. On the other hand, I liked Katz's recommendation of using a jug of water on top of a plate as a weight --- simple and free. I do have one observation even before we taste the sauerkraut --- the recipe is absurdly salty. When I cook it up, half a head of cabbage forms a meal for the two of us (yes, we're major vegetable eaters). At nearly 3 tablespoons of salt per head of cabbage, sauerkraut would provide three times our recommended daily allowance of salt in one serving. Perhaps sauerkraut and similarly fermented foods are meant to be a small garnish beside a large helping of other vegetables? That caveat aside, making sauerkraut was easy and fun. I'll post again soon with a taste-test of our first batch of fermented cabbage. That's interesting. I am growing cabbage for the first time this year and I was thinking of maybe making sauerkraut, so I look forward to seeing how yours turns out. That does seem like an absurd amount of salt. I wonder if a lot of it will be lost in the excess liquid that will form? Maybe it's necessary to have that much salt so you don't end up with any bad bacteria in there. My experience with lactofermenting has always ended up increadibly salty. With my first attempt on pickles, I found I had to drain half the brine out and replaced it with plain water in order to be edible. I fermented with the full salt, then diluted when I put them in the fridge. I made up a batch of sauerkraut yesterday using Katz's book, it also seemed very salty, I may try something similar when it's done fermenting. I noticed Katz has some recipies in his book for low salt sauerkraut. I'm wondering if any of your readers have tried them with success? I was into Ann Wigmore's raw vegan diet back in the 80's, and made plenty of sauerkraut. It was successful every time, and I never used salt. Here's one link. I had a different recipe, and used neither kelp nor juniper berries. I think I added some grated carrots. I did have to skim the brown crud off the top. I also don't care for the saltiness of kraut and other fermented veg, but rather than rinse all of it, which will make if susceptible to molds, we just rinse what we're going to eat at one meal. Another way to seal the top of the fermenting crock is to use the plate as suggested and then place a water-filled plastic bag on top of that. 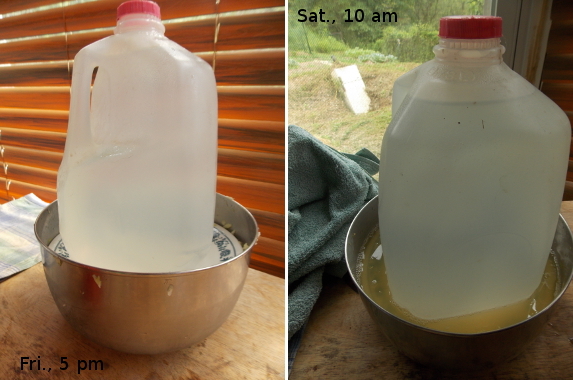 Make sure there are no leaks in the bag to dilute your brine. Just wondering if you drink Kombucha? My husband was having some stomach problems and since I've been making it (for about 3 years), he has had no problems like before. We're also big fans of sauerkraut and usually make 45+ quarts a year, good stuff. I am not fond of kraut I admit. If you have a lot of extra cabbage, try dehydrating it. I add it to soups in the winter for extra kick. The recipy you linked to uses a lot of salt (2% by weight). In Dutch recipes, 1% to 1.5% is generally advised, but you can use less. AFAIK, the salt has two uses. 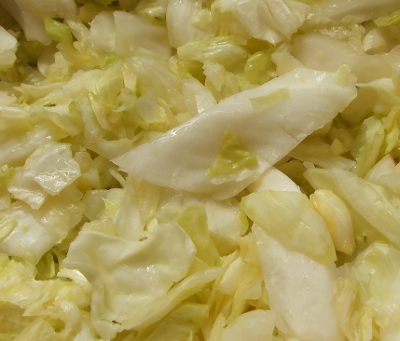 In traditional Dutch recipes, the cabbage is cut and placed in the crock pot in layers. Every layer was bruised with a beechwood masher, then covered with a bit of salt and some spices. The more you bruise the cabbage to liberate the fluids, the less salt you need to use. A salt-free alternative is to use 15 ml (one tablespoon) of buttermilk per 2 lb of cabbage to kick-start the fermentation. We generally sqeeze out the liquid (and most of the salt) before eating or using the sauerkraut. Yes, fermented foods are only supposed to be used as a small side dish to the other food in the meal. For one thing, with cabbage it has goitrogens in it, so large amounts of it may have detrimental effects on some people. Variety and balance of what we eat, including ferments, is important. However, to prevent excess saltiness I have preferred to use recipes that go by more weight and/or percentage of the cabbage and salt, at least until I become more familiar with it and do it based on experience. After all, when something says you should use "X" amount of salt for a head of cabbage, are they referring to a 3, 4, 5 or even 10 pound head of cabbage? P.S. This post (and some of the others) does not show up properly on the page for me. I have to scroll back and forth from left and right to be able to read it all. When I started to make my own sauerkraut, I came across the same recipes using 3 tablespoons salt per 5 pounds of cabbage. 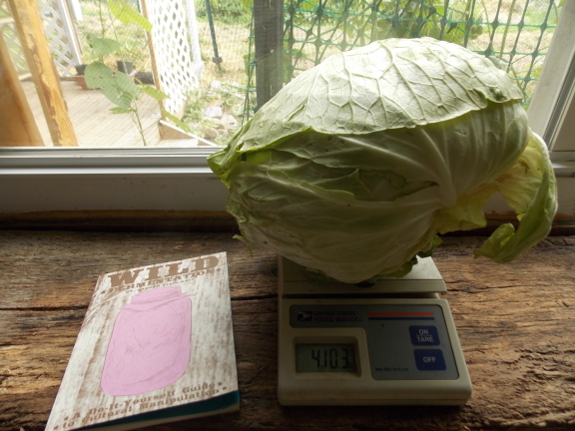 Now I am down to 1 teaspoon per 7-10 pounds of cabbage. It works and the sauerkraut has a mild sour/tart flavor. per my grandmother's method, i use 1 tbsp kosher salt per large-ish head of cabbage; less if the head is smaller. and that's plenty to make good kraut.